Match 40, Mumbai Indians proving their mettle once again, this time KXIP in the receiving end, Solid Fifties from Rayudu and Sachin, lead MI to 159/5 in 20 overs. Later chasing 160 runs against Mumbai wasn’t easy at any times, and it wasn’t so too… Marsh and Valthathy showed some promise before perishing to the creeping run rate. 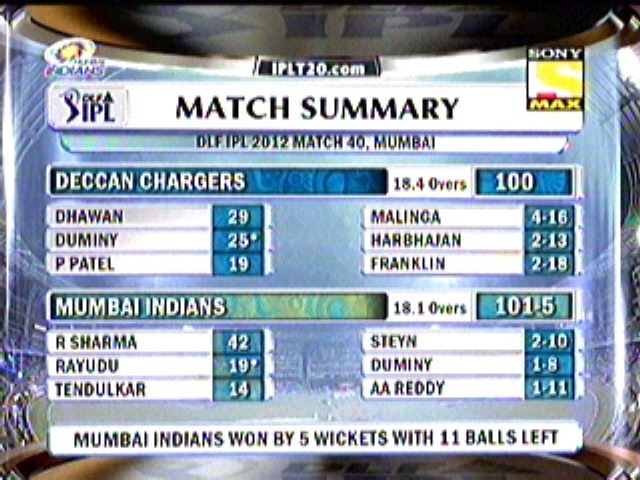 And Mumbai finally winning the match by 23 runs. Match 41, Match which defined that Delhi has no place to go for hiding, as they faced a humiliating defeat in front their home crowd, Delhi scored paltry of 140 runs in a very good batting track, which made the game easy for KTK as they went past 141 with 7 wicket and 30 balls to spare. – Sachin scored his 11th and Rayudu scored his 5th IPL fifties. – Parameshwaran picked up his Maiden IPL wicket and its Virender Shewag and later in the day he also picked up his first Man of the match award. A very important game for Three teams (am i confusing…?) Really not, third team looking close to this game is CSK, who ever win will make tough for the CSK, so they will be keen in this match result. Both teams Must win situation, Two Australian Legends head to Head. Gilly Vs Warne. Who will prevail.. Game had the answer for all who will be missing their nails by now (If u had nails u would have spitted out in this NAIL biting finish)..
Deccan home away home doesn’t favour in toss too, Shane won the toss and decided to Bat First, Cant say the best of the start, Lost both their openers in the third over, but not Watson as he continued play the innings where he left in the last game, (aided by Harris who also joined the list of catch missers) End of six overs, RR are 48/2… Fazal played along with Watson,who did play most part of the innings, finally Ojha got the best of Fazal, dismissing him in the 11th over, scorecard was 94/3 then, To add worry to injury Yusuf was caught out just for 4. Shilpa and Shamita kicked the chairs, which really meant the importance. Watson Continued to roll, at the end of 15 overs RR were 128/4, RR would certainly want to make up 180 from this position tat too with watson still in crease, (Plus u can count on Deccan’s last five over worst average of 11.32 runs), But it all went myth as Deccan’s spurred with wickets and RR went on for leather hunt, finally dismissing before finishing of the allotted 20 overs for 159. Deccan’s certainly pulled back the game on track, which shud really boost their confidence when they come into strike. RR 159/10 in 19.5 overs. DC 157/10 in 19.5 overs. 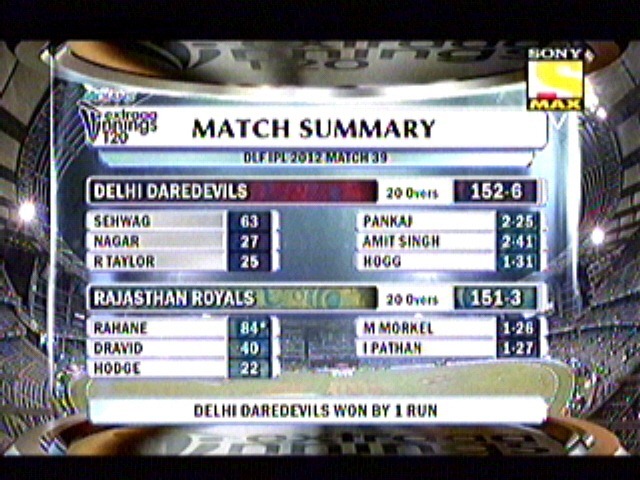 RR WON THE MATCH BY 2 RUNS. After a better performance in Bowling, DC looked quite positive in batting, Gilly took Watson’s over to start the proceeding, Shane got the debutant Dole to bowl at laxman , which resulted immediately as he was pouched in deep square for just 6. Gilly took him also but eventually Dole got him with a shorter delivery which troubled him throughout this season. Symonds and Rohit played sensible innings to sustain the scoring rate. Symonds was also constantly troubled by bouncers from rajasthan bowlers, finally it did pay dividend as he was out for 15 in 11th over. Sharma was joined by Aniruth singh, both almost closed the gates for Royals as scorecard was 112/3. needing 48 from 38 balls. Any day in T20 game with 7 wickets in hand, call it icing in the cake. Spin Legend Shane warne had other ideas as he started to spin the web sharp leaving rohit and venomed on rest wh0 didnt have much exposure to class act, All of sudden 141/7 in 18 overs. Needing another 19 in last 2 overs, Rohit still around proved his selection right by picking 13 runs (Inclusive of one boundary and a six)in the penultimate over, leaving just 6 needed of last one. This isn’t new for Rajasthan as they have been in this situation many a times, Trivedi bowled the last over to choke Deccan’s to lose the match in the end,still leaving one ball to face. Rohit sharma who was the last man to dismissed throwed down his bat in disgust. Can feel how will it be to battle all alone with no one to help around, feeling sorry for this man… In the end Rajasthan prevail the nail biting finish to give headache to CSK. 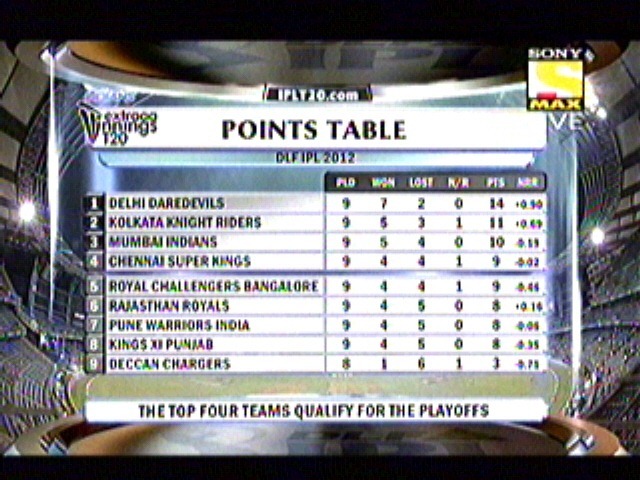 Bcos RR go past CSK with 10 point. 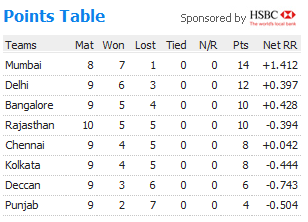 Tomorrow’s game is certainly the game for Chennai, they have play their skin out, to beat a team like Mumbai. – Shane watson scored his 6th ipl fifty. – RR have the lowest 1st batting average score of 152 in IPL 2010. – Rajasthan Royals has never lost a match when they have scored 150+. – This is second time Royals winning the match by 2 runs. out their allotted 20 overs. – Shane Watson’s 10 Ball over is the highest for this season. (6 legal + 4 wides). – Rohit Sharma Crossed 1000 runs in IPL, and he is the 4th one to do after Gilly, Raina and Hayden. Orange Cap – J.Kallis (425) followed by Sachin Tendulkar (349) and Naman Ojha(308). Most Fours – Sachin Tendulkar (52) and J.Kallis (52) tied for top spot.